Like Cult Film Club? Like Stickers? 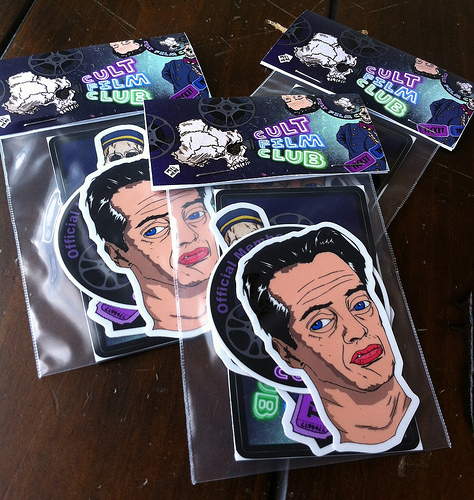 Then get some of our Cult Film Club stickers! Jaime, Shawn and I hope you have been enjoying our new podcast. It’s a lot of fun for us and we really have received a lot of nice feedback concerning the show. We love all of your comments and movie suggestions. Thank you so much for your support. Speaking of support, Shawn has put together some of the artwork he’s done for the show and made stickers out of them. Check ’em out! Each sticker pack contains 4 die-cut stickers measuring 2.4″x2.4″ and 3.4″x2.4″, featuring the CFC Logo, Official Membership Badge, our mascot the Phantom Ticket Taker, and the one, the only Mr. Pink (Steve Buscemi)! These sticker packs have been put out there and are ready for you to purchase to help support us, your favorite podcast of all time (alongside Nerd Lunch of course). It’s our way of honoring Mr Pink’s “no tipping” policy by offering you the chance to not tip us and still support us for bringing you some awesome content. Plus, you know, STICKERS!!! FYI, if you decide to order these bad boys, hop on over to Branded in the 80s and let Shawn know you ordered the sticker packs and, if you ask nicely, I’m sure he’ll include that awesome Branded in the 80s sticker you see in the upper right of the first picture. Again, Jaime, Shawn and I thank you guys for all of your support. 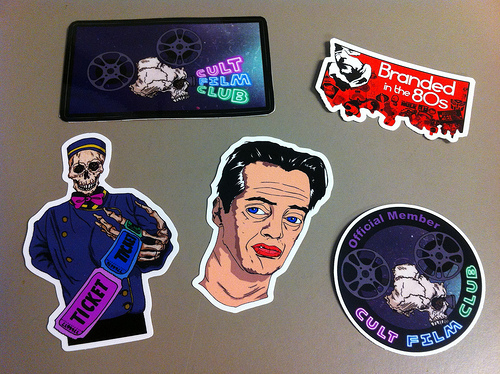 Click here to be transported via the Interweb transporter device to the Cult Film Club sticker store. This entry was posted on April 18, 2013 at 10:31 am and is filed under movies, podcast with tags Cult Film Club, movies, podcast, stickers. You can follow any responses to this entry through the RSS 2.0 feed. You can skip to the end and leave a response. Pinging is currently not allowed.